Home / Lifestyle / Culture & Society / S. Koreans Grieve in Memory of Victims of Sewol Ferry Sinking on its 5th Anniv. JINDO/MOKPO/ANSAN, Apr. 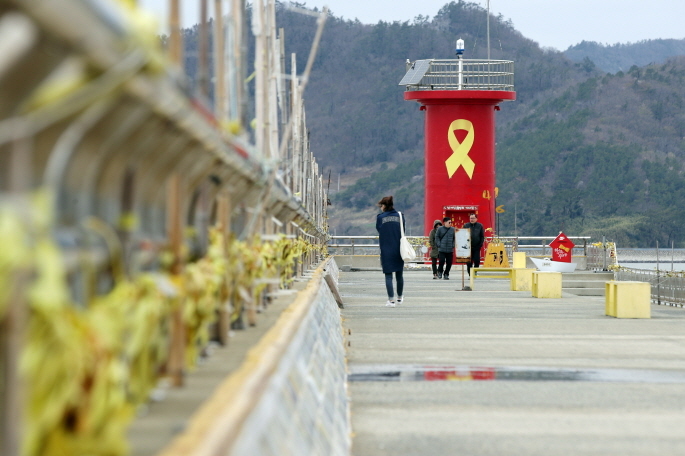 16 (Korea Bizwire) – Yellow ribbons tied to a breakwater at the southwestern port of Paengmok wave in the wind, a symbol that commemorates those who died in a deadly ferry sinking in 2014. Their color has somewhat faded with the passage of time, but the port still stands as a pilgrimage site for those who want to commemorate the victims of the sinking of the ferry Sewol. 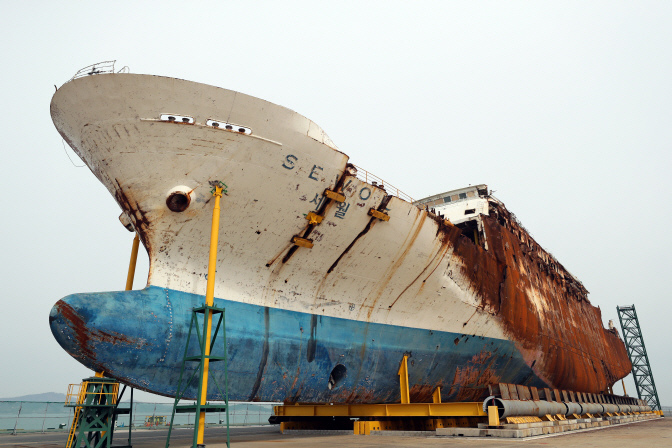 Tuesday marks the fifth anniversary of the 6,825-ton ship sinking off the southwestern coast near Jin Island while en route to the southern resort island of Jeju. The tragedy left 304 passengers dead, most of them teenage students on a school trip. The incident was one of South Korea’s worst maritime tragedies. At the time of the incident, nine of those aboard went missing. Later, the bodies of four victims were recovered during a belated salvage operation, but the other five still remain unaccounted for. The ferry sinking has left an emotional scar on many South Koreans and remained as a national trauma following the then conservative government’s botched efforts to rescue the victims. The Paengmok Harbor, which is located the closest to the site of the ferry disaster, still invites a stream of mourners who come a long way to remember the victims. Park Soo-beom, 55, said he was barely able to visit the harbor and only after he struggled to solace his aching heart over the past five years. “It is so heartbreaking as I looked around the site. 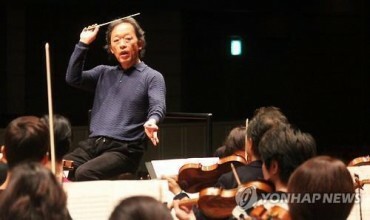 There is nothing that I can say except that I am sorry,” Park said last Wednesday. An altar to mourn the victims was torn down last year. Instead, a container facility was set up to be used for the Paengmok memorial center, a make-shift venue to commemorate the victims. 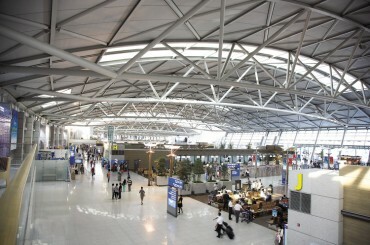 Most of the victims were students of Danwon High School in Ansan, just south of Seoul. At the center, group photos of the young victims having big smiles are hung, instead of the victims’ portraits used for the mourning. The fate of the facility, however, remains murky as the provincial government plans to set up a passenger ferry terminal at a nearby site despite opposition from the bereaved families and civic groups. Kim Jeom-soon, 47, a visitor to the center, said whenever the spring, her favorite season, comes, she feels agony thinking about the tragedy. “I think there is a need for a (permanent) space dedicated to remembering the disaster and raising awareness about such incidents, not something like the existing one,” she added. Koh Young-hwan, the father of the victim Koh Woo-jae, is the only remaining bereaved family member who still stays and lives at the harbor. He is demanding authorities set up an archive that records the Sewol tragedy at the site, instead of the terminal. “Whether five or 10 years have passed or not, I cannot go home as investigations have not found almost anything. Nothing has changed,” he lamented. The ferry sinking sparked a barrage of public outrage as initial probes revealed serious shortcomings of the government’s response system for rescue and salvage operations. In particular, then President Park Geun-hye came under fire for her unknown whereabouts at the critical time of the sinking. It later became one of the triggers that led to her parliamentary impeachment in December 2016 and ouster the following year. But what caused the ferry sinking has not been fully verified despite a yearlong state investigation. A state panel has failed to pinpoint the exact cause of the accident, as it concluded last year that the Sewol sinking could have been caused by either problems with the ship or an unknown external shock. Problems with the ship could include a sudden turn of the ship, excessive cargo load and substandard refurbishing of the vessel that could have affected its stability and buoyancy. External factors could be a collision with a submarine or other unknown objects, the panel said. In 2017, the government launched an operation to search the remains of the wreck of the vessel. The sunken hull was raised from the bottom of the sea and put onto a dry dock at the Mokpo port, some 410 kilometers south of Seoul, in April of that year. But only the bodies of four victims were found among the nine people who were missing. With the exact cause still unknown, there are growing calls for the punishment of those who are responsible for the government’s botched attempt to rescue the victims. On Monday, civic groups unveiled the first list of people and entities that should be accountable for the tragedy, demanding their punishment. The list includes 13 government officials and five organizations. Among them are former President Park, her former chief of staff Kim Ki-choon and Hwang Kyo-ahn, a former prime minister under Park’s administration and the current chief of the main opposition Liberty Korea Party. 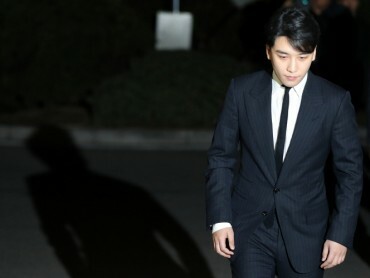 “Still, an investigation into hundreds of those who are responsible for the incident faces a setback due to allegations that the then Park government interfered in a probe and sought to cover up the fact,” activists said. “Those who allegedly blocked 304 people’s evacuation should be immediately punished for the ferry sinking,” they stressed. Ahead of the anniversary, people visited the rusty hull on display at the Mokpo port. Mourners are allowed to closely look at the vestiges of the tragedy on weekends. 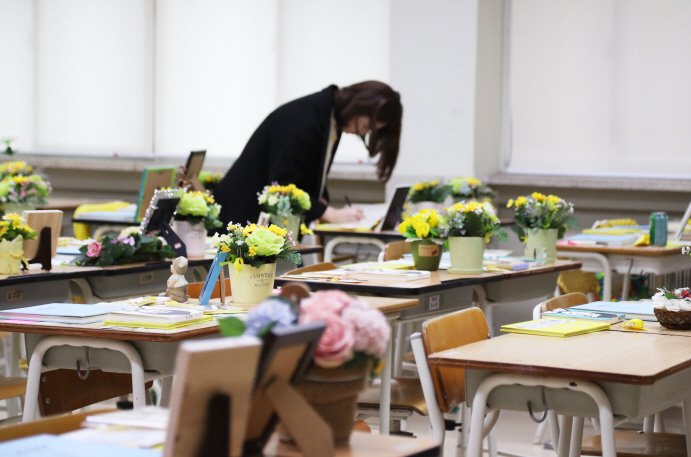 They also visited the recreated classrooms of Danwon High School to remember the victims, who were sophomores. The “416 remembrance classrooms in Danwon High School” were preserved at the school for more than two years after the sinking. The classrooms were recreated later at an auxiliary building of the Ansan education office and made public in November 2016.